Fractal Combat 1.0 on App Store! The App Store submission came and went. This was a surprisingly quick approval for the game. 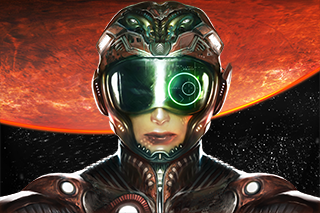 As so, Fractal Combat is now out on Apple’s App Store ! Here is the official App Store link. As tradition wants, we’re going to support the game with several more updates. We’re already working on a 1.1 that should add more game play and additional items. Let us know what you think about the game.. what you like, what additional features you’d like to see, what you’d like to change. Your comments will help us improve the game. You can comment on the blog or contact us from the Contacts page. We just recently submitted the 1.0 of Fractal Combat to Apple ! Judging by Apple’s current average approval times, if everything goes to plan, the game should be out around the 2nd week of August. This new game follows our general preference towards arcade action games. But it does have some simulator traits, at least aesthetically. The in-game HUD is somewhat similar to those used in jet fighters, down to the vector-nature of the font used, and specifically made for this game. The game offers plenty of missions and several worlds. All missions are fairly linear, and basically require to shoot down predefined targets. It’s very much a missile-shooting fest of a game, though there is a Garage where one can sell and buy ships, weapons, Radars and generators. As we did with Final Freeway, we’re already planning a few updates that will introduce further compatibility, game play tweaks and requests from the players.. when possible and when there is enough demand. So, the big day is coming.. ! Thanks for your support and make sure to spread the voice around ! Final Freeway for Android 1.2 is out ! We’ve just pushed the version 1.2 of Final Freeway for Android in the Android Market. This new release improves performance (especially with low detail settings) and fixes a few issues that some experienced with sound and with the installation procedure. Final Freeway 1.5 update for iOS is out! The Final Freeway 1.5 update for iOS has been approved by Apple and it’s starting to be available on all the regional App Store markets (it may take a couple of days before the update spreads). This a service update, with easier Normal mode, better Game Center integration and better iPad screen usage (no more letterbox while playing). We’ve recently submitted the version 1.5 of Final Freeway for iOS to the App Store. The new release (hopefully coming in a week time or so) is a service release mostly aimed at improving Game Center integration, and to bring some minor changes and addition developed for the Android version, back into iOS. With this new version, Game Center’s display should be properly oriented in landscape (still some issues on iPad though). Also, from now on, all scores will be reported to the Game Center leader-board, while previously one had to make it to the local high scores table before being able to post an entry on-line. iPad display in 1.5 will be used at 100%, while up until now it has been letter-boxed. We also added the low detail display mode for even faster frame rate, and added the auto-accelerate control mode, where the player needs to touch the screen only to brake. The Normal difficulty mode now also has much less vehicles populating the roads, making it for a smoother experience for the beginner players. While this doesn’t break any grounds, we hope that you’ll appreciate the effort in keeping the game up to date. We’ll post more news as soon as the update is approved and available in the App Store. Final Freeway for Android 1.1 is out ! We’ve just released the version 1.1 of Final Freeway for Android OS. The major addition of this update is OpenFeint support, which, for the time being is an exclusive for the Android OS version (iOS is instead based on Apple’s Game Center). “Final Freeway Lite” now on App Store! “Final Freeway Lite” is now available for iOS in the App Stores world-wide. This is the free version of our “Final Freeway” game that has been available for $0.99 since late August 2010. We just submitted Final Freeway Lite to the iOS App Store. We are now waiting for Apple’s approval process to complete. Once available, this will allow everyone on iOS to try a reduced version of the game at no cost. A similar lite edition should appear for Android OS in the near future. Final Freeway for Android OS released ! It’s out of the bag..
Now available on the Android Market as well !